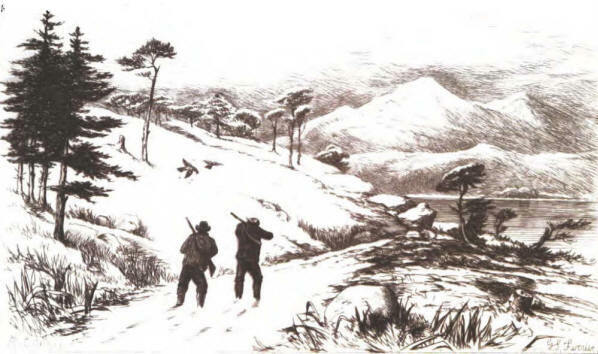 In the autumn of 1877, Professor Newton of Cambridge intimated to me that he desired to have some account of the increase and extension of range of the Capercaillie in Scotland Although possessing a fairly accurate conception of its general distribution, and the lines of its advance outwards from Taymouth, where it was restored in 1837-8, I found that I was wanting in the more minute details which it would be necessary for me to possess before I could furnish a suitable reply. Accordingly, I began inquiries; at first simply with a view to furnishing Professor Newton with a short summary for his new edition of Yarrel's “British Birds'9 But information of such valuable, suggestive, and interesting kind came to hand, that I soon conceived the project of treating the subject more exhaustively. I reflected, moreover, that, besides being of general interest to the naturalist in this country, the subject might be made illustrative of a great natural law, arid of the causes and process of distribution, and the increase in population of a species. I found also that while interesting to the naturalist and sportsman, it might also develop questions of economic value to Scottish or other landed proprietors, and be made to contain many local references interesting to individuals who own Capercaillie-haunted woods and forests. With this view, therefore, I caused to be printed a series of queries touching the points I specially desired statistics and information upon, and by the beginning of 1878, was engaged in sending out the circulars, receiving answers, and, as far as possible, arranging the results. The final results have far exceeded in interest my most sanguine expectations; though whether I have succeeded in conveying these results successfully and practically to my readers in the following pages it is for them to judge, not me. In the treatment of the subject I cannot lay any daim to originality, nor am I aware that any previously unknown facts are recorded. The treatment has been forced upon me by the large accumulation of data kindly put at my disposal by my many correspondents in this connection. The general remarks are the outcome of the statistics, and contain, I believe, little or nothing that Is not known or believed by some of the landed proprietors and sportsmen in the area of the country inhabited by the species, I have not attempted to give my authority for every statement, where such a large amount of statistics came to hand. Errors no doubt must have crept in in such a compilation, for various reasons, but I believe that I have an authority for every statistic recorded. I desire in this place to thank those who have so liberally assisted me. Had it not been for their interest in the subject, their never-wearying and hearty co-operation, and their courteous replies to my inquiries, it is needless to say this Essay could not have laid claim to the minuteness of detail which I trust it will be found to possess. Where all have' assisted so liberally it might seem invidious to particularise; but I cannot neglect to record my special thanks to a few who have apparently spared no trouble in assisting to gather materials, often from comparatively large areas, thus saving me an infinitude of time and labour, and a vast amount of personal investigation. I am also indebted to many others for assistance in the searches through old books in tracing the early history of the species in Scotland, and to several Gaelic scholars for assistance as regards the origin and etymology of the word “Capercaillie!. To Sir Robert Menzies, Bart., I am obliged for some interesting notes of the earlier movements of the birds at Taymouth, and for other information. Colonel Drummond .Hay of Seggieden; Sir Thomas Moncrieffe, Bart. ; C. T. C. Grant, Esq. of Kilgraston; Dr. Macintosh of Murthly; Mr. E. Paton of Perth; and Mr. E. Anderson, Dunkeld, have greatly assisted me in their various districts. James Haldane, Esq. of Cloanden, A. Bum-Murdoch, Esq., and J. Buchanan Hamilton, Esq. of Leny, have also collected materials for me between Perth and Callander. J. J. Dal-gleish, Esq. of West Grange, has assisted me in the south of Perthshire; James Stirling, Esq. of Garden, and others, in the south-west; Mr. Dayton of Locheamhead Hotel, and David Carnegie, Esq. of Stronvar, in the west and in Glen Dochart. My friend, W. Horn, Esq., has collected statistics from various parts of the Tay Valley, and also from other counties. Besides the above there are many others, representing over 150 estates in Perthshire alone, from whom I have received returned and filled circulars. To all I desire to express my best thanks. In Forfarshire I am indebted to various correspondents. Especially I should mention W. Scott-Elliott, Esq. of Fother-ingham and Tealing; W. Horn, Esq., for the Brechin and Stracathro district; and many others too numerous to mention, representing some 20-30 estates in the county. In Fifeshire my thanks are specially due to J. Purvis, Esq. of Kinaldy, Charles Kinnear, Esq. of Kinloch, William Baillie Skene, Esq. of Fitlour, J. J. Dalgleish, Esq. of West Grange, J. Home, Esq. of Thomanean, Robert Tullis, Esq., and others. In Kinross-shire I am obliged to David Syme, Esq., Sheriff of Kinross, and to Messrs. Bethune, Henderson, and Bums Begg, for very full particulars; also to Harry Young, Esq, of Cleish. In Stirlingshire, James Stirling, Esq. of Garden, T. G. Dundas, Esq. of Torwood, Sir James Gibson-Maitland, Bart, of Sauchie, T. Bolton, Esq. of Carbrook, and others, representing all the more important localities in the county, have assisted me. In the south of Scotland I am indebted to several correspondents, amongst whom I may mention the Rev. James Porteous of Ballantrae. In Argyleshire, amongst others, I would mention the Eev. Alexander Stewart of Nether Lochaber, for much interesting matter. To the Factors, Foresters, Gamekeepers, and many others who have sent me returns from single estates or localities, I desire to express my best thanks. It was upon these single returns that I depended in great measure for assistance in tracing out the steps of advance; and from the letters of my many obliging correspondents I often culled interesting additional facts. I may mention that I have distributed more than 450 circulars to parties situated in all parts of the area at present occupied or visited by the species. By far the larger portion of these have been returned with the answers filled in, more or less fully, according to the amount of information my various correspondents had to impart. Finally, Robert Warren, Esq. of Moyview, Sligo, Colonel Edward H. Cooper, of Markree Castle, Sligo, and A. G. More, Esq., Dublin, have rendered me valuable assistance, some of the results of which will be found in the Appendix, as they arrived somewhat too late for insertion in the text: and to my friend Mr. Robert Currie I am indebted for the careful and beautiful execution of his subjects, in illustrating the text, with the frontispiece, vignette, and other pieces.